Fresh Field Pass episodes have arrived! From the parking lot to the stadium tunnel to the 50-yard line! Drum Corps International's Field Pass podcast presented by Zildjian delivers exclusive news, interviews, previews, feature stories and analysis of all things drum corps. 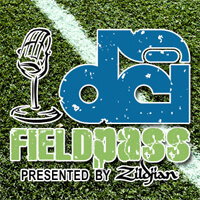 Hosted by longtime DCI announcer Dan Potter, the Field Pass is back for the 2012 summer season with brand new episodes and a new format. "This summer we wanted to connect quicker and more frequently with drum corps fans by giving them quickly consumable glimpses of the 2012 DCI Tour," says Potter who has been producing the popular podcast since 2005. Field Pass "Tweetcasts" will be released Monday through Thursday via DCI's official Twitter page, @DCI_Tour, which will include short interview segments and other brief features about a minute in length. Those Tweetcasts will lead up to a full long-listening podcast posted every Friday on DCI.org. "The longer Friday episodes will give fans a chance to enjoy the podcast at their leisure over the weekend," Potter said. "It'll be great listening when you're on the road to see your favorite corps." Listen to the very first Field Pass episode of the 2012 summer season below, and be sure to follow DCI's official Twitter page @DCI_Tour for the latest episodes each week.